Sarah here, like many of you, has an authentic desire to better the world to which she was born. Many millions of souls have come, made efforts, and vanished from our memory, doing good deeds for the world and each other. Why then, with so many good people trying so hard has the earth reached this potential ecological apocalypse? If we are to break this syndrome and foresee a better future for all of us, we must look to why good people make bad futures. In my household we made many changes. We use less water, we try to live sustainably. But, even so, no one is perfect. Seeing neighbors being horrible to this earth makes my skin crawl. I try not to dig out of their trash and organize in into recycling bins. Perhaps one of the most fundamental habits undermining each of us is a noble idea that we must save the planet. Meditating upon Sarah’s letter has directed me to read a passage from my teacher of meditation, Osho. His answer to a disciple uncovers our “save the world instinct.” It is an instinct mimicking virtue. “It may save the beautiful planet, but you should not carry the idea within you; otherwise it will destroy your love and your dance and your joy. If deep down you are guessing that ‘my love, my dancing, my joy can save the whole planet,’ it is the strategy of the ego. You are becoming a savior. You are becoming so great that you can save the whole planet, just by your love and just by your dancing, just by your joy. “Try to understand the complexity. It is possible, if individuals are full of love, full of joy, and their life is not a drag, but a dance…as a by-product it is possible the planet may be saved. But as a by-product — you cannot take the credit for saving the world. Session 16: Love is Always an Emperor. What I read Osho saying is radical. It is upside down from how we have been taught to be right-side up. And frankly, if we were seeing the problem right-side up, a solution to sustain, let alone save, the world would have blossomed and succeeded long ago. The egoistic abuser of the earth and the egoistic do-gooder for the earth are habits and personas we have had affixed to our souls by our society. 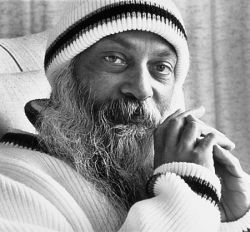 Osho used to mispronounce the word “society” as “suici-ety”. Perhaps he did this on purpose, because if we unconsciously continue to follow our society’s suicidal programming then humanity does not have a future. That revelation no longer frightens me. Energy is neutral. The mind gives it a false color. The soul, however, free of the mind and personality can turn terror into a celebration of the urgent need to change, to light my candle in the darkness. What haven’t humans of good conscience done to try to save this world? All efforts to bring peace on Earth have failed; at best we have weathered and adapted to wars and disasters and dulled our pain with holy consolations. We have established laws to govern our actions because we are incapable of living according to our own consciousness. The imposed conscience of societal morality prevents us from ever living beyond the mechanical knee-jerk worship of duty and following orders. At best, our civilization has functioned but not flowered. All the ingenious efforts to save the world have done nothing but bring us to this dangerous crossroads. One can despair at ten thousand years of failure, or see each disappointment as a step closer to success. Where we are now tells me that humankind must be very close to the answer. We stand before a tomorrow of fear or a tomorrow of revelation. The seers of the future are trying to give us instructions on how to build a bridge to endless tomorrows rather than stumble along with our cherished traditions and beliefs to an all-too-predictable disaster. Perhaps we are unable to save our planet because nearly all of us are missing the obvious and necessary first step to save it. And that first step can’t even be considered because our past-oriented programming is preventing us from even knowing there’s a first step to take. The key must be right in front of our noses, maybe even closer. That is why we’ve always missed it, life after life, eon after eon. Society has trained everyone not to see the key. I have seen this heartbreaking truth in every culture I’ve encountered, no matter how different its façade of morality and tradition. Everything. Because the reflections you have just read are the kind of things the television editors and their corporate handlers leave on the cutting room floor in over 100 documentaries in which I have appeared since 1987. They do this because they do not think you are interested or even intelligent enough to hear and see me saying such things. Moreover, such observations are dangerous to the status quo because these dictators of media dissemination rate your stupidity as higher than the ratings they might risk losing if they edited documentaries to match your intelligence. Perhaps they are right. Perhaps as long as we remain part of the masses rather than live as conscious individuals the television industry is serving up exactly what we want to see on the tube. I for one would like to risk testing your ratings as intelligent beings because I am in the unique position not held by any prophecy scholar in 20 years. I have been on just about every major documentary on prophecy and Nostradamus since 1987. I know intimately what has been left out of these documentaries. In Part four, I will continue responding to Sarah’s letter and look farther behind the gloaming glass filter of your television’s flickering eye. This entry was posted in Media Filtering and tagged Hidden Splendor, Media Censorship, Meditation, Nostradamus, Osho, savior. Bookmark the permalink. Post a comment or leave a trackback: Trackback URL.